Perfect Portal is Australia’s only dedicated sales and marketing platform that enables law firms to differentiate, communicate more effectively and win more business! With seamless integration into LEAP, Perfect Portal streamlines your workflow and facilitates all the communications between the key parties involved in matter, all controlled from within LEAP. Perfect Portal clients are also able to also generate quotes or cost agreements for potential clients in under five minutes and monitor the firms commercial performance from a fully customisable dashboard. "The integration with our practice management system which for us is LEAP has been brilliant. We can accept a quote with a click of a button it will then open up in LEAP and our solicitor or conveyancer can take over that matter and update Perfect Portal within LEAP they are not swapping between apps, they go straight there to update the tab and everyone's communicated with immediately." "Since getting Perfect Portal, we have not only doubled the quotes we are generating but we have also tripled our conversion rate." "We strive to have and are dedicated to delivering exceptional customer service here and the Key Stage update just gives another avenue to update the client quickly and concisely. 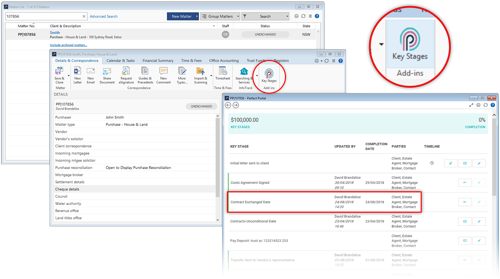 We have moved away from sending precedent emails and letters for these updates from LEAP and now use the Key Stage feature in Perfect Portal as it is easier to manage and gives a very succinct update to the client without them having to open email attachments. It also gives us a very quick overview of our live matter key stage status’s which helps to ensure no matter has missed an update. Perfect Portal has changed the way we operate as a business. It has improved workflow and increased efficiency. We have more time!"